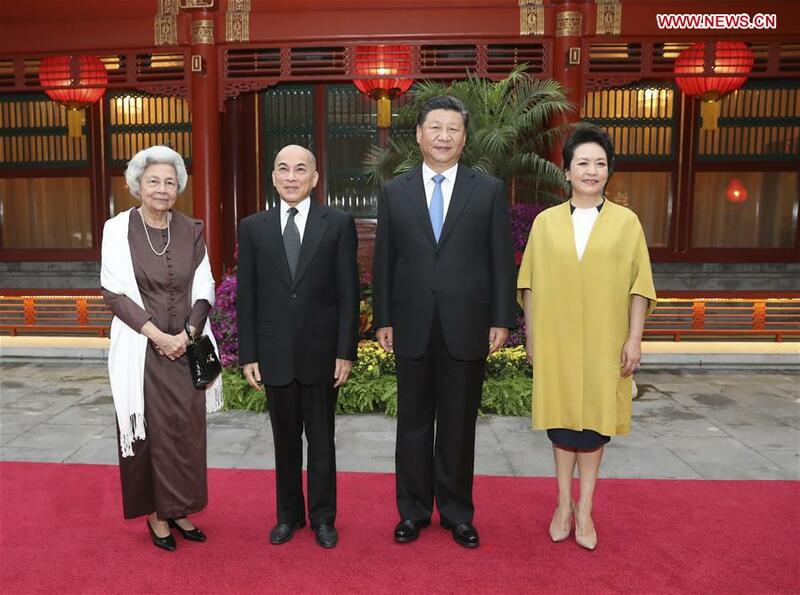 BEIJING, Sept. 19 (Xinhua) -- Chinese President Xi Jinping and his wife Peng Liyuan on Wednesday visited Cambodian King Norodom Sihamoni and Queen Mother Norodom Monineath Sihanouk, ahead of the traditional Mid-Autumn Festival, in Beijing. Wishing the King and the Queen Mother a happy festival and good health, Xi said the close and special relationship between China and Cambodia is characterized by deep historical feelings. Since the two countries established diplomatic ties 60 years ago, the China-Cambodia friendship, which was forged and cultivated by Chinese leaders of the older generation and Cambodian King Father Norodom Sihanouk, is growing more and more vibrant. Applauding King Sihamoni and Queen Mother Monineath's significant contribution to the bilateral relations, Xi said China treasures the special friendship with the Cambodian royal family. "From 2016 until now, I have met with King Sihamoni and Queen Mother Monineath every year, just like gatherings between family members," Xi said, adding that he and King Sihamoni have reached important consensus on inheriting and carrying forward the traditional friendship, leading the bilateral relationship to the best-ever period in history. Xi called for frequent interactions between the two nations at a high official level as well as among the people "like close relatives." Congratulating the successful general election in Cambodia, Xi expressed his wish that the Southeast Asian country win new and greater achievements in its national development. Xi said China attaches great importance to its ties with Cambodia and will work together with the Cambodian side to carry forward the traditional friendship and step up the comprehensive strategic cooperative partnership continuously. Expressing their gratitude for Xi and Peng, King Sihamoni and Queen Mother Monineath said it feels like meeting family members every time they see President Xi and Professor Peng. The Cambodian people are grateful for China's firm and long-lasting support and assistance as well as President Xi's great attention to the development of the Cambodia-China ties, said King Sihamoni and Queen Mother Monineath. Recalling President Xi's historic visit to Cambodia in 2016, King Sihamoni and Queen Mother Monineath said the visit elevated the Cambodia-China relationship to a new high. Hailing the firm friendship and booming cooperation between the two countries, the King and the Mother Queen said the royal family will inherit the friendship forged by King Father Sihanouk and continue advancing the comprehensive strategic cooperation between Cambodia and China.